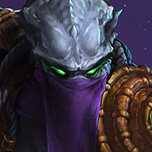 Seems you threw alot of stuff together that seems off putting a little on his design namely the healing aspects being thrown in with his normal snake people and green fireball abilities, i also don't understand fully what you meant with your trait like is it like Nova/Zeratul or is it like them + Tyrandes heroic which works on allies too?, overall you did throw in alot of Diablo themes here so least it shows you did do your research mate. Overall what theme is he trying to fit? is he a specialist? an assassin? or a support cause he seems to throw many of those elements together (and while Hybrids aren't bad) it isn't clear what his focus is. I will admit he does match Belial in the ways of Green flaming abilities and his favourite minions the lamia snake people and that stealth would also match his Lord of Lies title since he isn't usually upfront with things. So far his interaction seems to be either disruptive to his enemies or a boon to his allies and judging by talents so far seems to distant from his interaction role even more so then Kharazim from what i think. Belial without his true form isnt Belial. Maybe similar to Ragnaros skill but you can do it wherever you want, and you become unable to move but with large area skills (the breath, the meteors and the punch). As lord of lies i would put him some form to copy enemy heroes and try to be one of them, and taken the skills without ultimate and doing less damage (he would be part of the enemy team when mimicking a enemy hero until Belial attacks or the real hero stays X secons in a sort area aound him). Where do I begin. First things first, the design in and of itself doesn’t bring anything to the table new besides perhaps another take on vision shred, baseline team stealth, and summons on a support. The problem is, none of this really brings much out in the character. None of the abilities in and of themselves are interesting, with his E’s charge mechanic being far from saving it (Tyrande’s does this as well as a slew of other things), and his Q being one of the most generic damaging skillshots in the game, comparable to Frostbolt. The snake men that are summoned don’t offer anything interesting or unique, and are pretty much just flesh bags to take damage and add a little bit of damage (hardly an interesting niche since Anub’arak does it but more interesting on his trait). The two heroics are alright, but don’t provide enough to justify the lackluster base kit. Similarly, the talents add little to the character. While some talents are pretty cool, like Tier 5 talents and the Tier 1 trait upgrade (names would be helpful for the abilities and talents, if you can spare the time. Most talents offer menial bonuses, not really offering divergent playstyles or engaging gameplay. All in all, I am a bit disappointed, because I have seen much better from you in the past. At is core, the kit offers very little to connect itself. It has a damaging skillshot, a summon spell, a heal, and a mass invis field. The heroics offer some disruption or a protection spell. Brought together, the role of a support emerges, but that alienates two of your 3 basic abilities. I really think your Q and W should introduce something to add to the support theme. They don’t have to be healing by any means, but I would like to see some disruption or something baseline. Both seem pointlessly interwoven in the design. 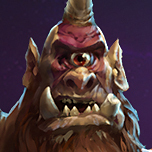 The talents have some cool synergy, but they seem superficial. 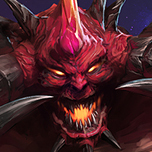 I would like to see some more interaction within the talents, and more distinct playstyles and builds emerge. A talent I want to note, I love the Tier 2 (level 4) armored healing bonus on the E, but he has no real way to get armor outside of his second heroic. I think some other talents to give armor would work better here, or maybe even make it baseline (if three enemies are poisoned by Q, gain 10 armor or something). Also you have talents already that grow in power based on the number of enemies hit by your Q, but as of right now even with talents, you can only have 1 enemy hit at a time. Am I missing something? While Belial does shoot green fireballs, summon snake men, and rely on sneaky tactics, I don’t really understand the heal or second heroic. I also don’t understand several of the talents. While I can definitely see Belial as a support, and even made a support Belial concept myself, I think you missed the opportunity to make his supportive elements thematic. He is a demon, and fits the contest, however. The design has some interactive elements, with the Q being a skillshot and the snakemen being killable, and the second heroic only healing when your allies take damage, but that’s about where the interaction ends. The heal is set, and doesn’t require any management of resources or active engagement to benefit from it (compared to Uther, Tyrande, Li Li, Morales, ect). I am always cautious about adding in summons, and Blizzard has expressed time and time again they want to severely limit the number of summons in the game for their uninteractive gameplay feel. The stealth feels obnoxious for the enemies to deal with, considering the invisibility is instant. Also, how does allied stealth work? It is broken by dealing and taking damage, just like normal, right? If so, you should make sure to specify the delay before they can benefit from the cloaking field again. I want to note that I truly hope you do not give up or feel attacked by this review. I encourage you to tackle the problems in your kit head on and try to amend the issues for the following weeks. A bit hard to judge this concept, because the descriptions are very brief and leave out many details, for example I don't know how much mana the character has, so I can't judge if and how the included mana costs would affect his play stile. I don't even know which form he's in. 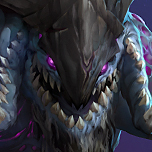 You purpose Archon and ghost skins (which have no legs, assuming a "normal" ghost rather than a Starcraft spec-ops unit), so I guess it is his true form, but you also say he mounts normally, so I don't know. His abilities are pretty bland and badic in their functionality, but lack something to bring them together and make them interesting despite their simplicity (unlike other concepts in the contest). I'm not sure how the snakemen work (do they lane, or follow Belial, or something else?, do they have timed life?, etc) so it's hard to tell how innovative they are as far as summons go. The same goes for his second heroic (does it affect an area, or just buff all allies in the map?). His talents are rather generic (though not the worst I've seen), but it would help a lot to make them more flavorful to add good names to them (or at least to his trait, abilities, and heroics). About the skins, again, it's hard to tell how well they fit if I don't know what his base model is, but assuming it is his true form, they fit well enough, I guess, though I don't know how a Tal'darim Archon would look (if they even can Archon meld), or Janus for that matter (but in this case the fault is mine, for being uncultured in roman myths :p). His abilities feel completely independent from each other, though this is mitigated by a few talents that make one ability give bonuses to another. There are a couple of build paths available, nut also several talents that feel disconnected from the rest of his kit. Overall, the talent tree has a "Quantity over Quality" feel to it IMO. Most of his kit works well with the character, being pulled from his D3 appearance or from his lore, but I really don't know what that healing is doing there. Depending on the details of how his trait works, it could be annoying to play against, giving his whole team a way to easily escape from AAs and targeted abilities, which could feel really cheap.